In the first of two pieces on changes in the political art in Northern Ireland, the BBC News website's Marie Irvine goes to Londonderry where a collection of murals is proving illuminating. The political murals of the Bogside artists in Northern Ireland's second city have become known as the People's Gallery. Its creators see it as a gift by the people, from the people to the people, because the collection of public paintings was financed by local door-to-door collections in this nationalist part of town. "It's a gallery that will be there in perpetuity," says artist William Kelly. 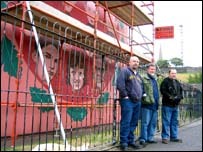 William with his brother Tom and friend Kevin Hasson, are the men behind the murals. 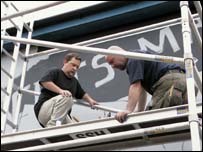 Together they have created the ten public paintings which make up the gallery along the gable walls of Rossville Street. This is a largely peaceful part of town now but during Northern Ireland's Troubles it was the scene of many tumultuous events and violent clashes between the security forces and local population. The murals visually narrate what the artists see as seminal moments in the city's modern history. 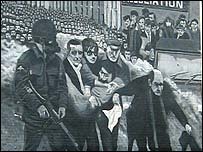 The most famous depicts Bloody Sunday when the army shot dead 13 civilians during a nationalist civil rights protest. A 14th man later died from his injuries. A young curate, Father Edward Daly, later to become the city's Catholic bishop, waves a white handkerchief as he tries to lead others carrying one of those injured to safety. But if the images are the bleak testimonies of conflict the gallery was conceived in peace as something of a retrospective. The mostly black and white pieces were started in 1994 as Northern Ireland was embracing the paramilitary ceasefires of that year. Significantly the final mural, a dove of peace, completed in late 2004 was in colour and placed at an exit to the Bogside as a final chapter of the story. Now the walls are receiving official recognition from Derry City Council which has decided to fund the refurbishment of the murals and to install beam lighting. It promises to add a spectacular dash to what is widely acknowledged as one of the most visited attractions in the maiden city. Mark Lusby is the senior economic development officer with the council. He hopes the improvements will be in place for the autumn. "The purpose is to use lighting as part of telling the story of Derry and to make it as exciting and dramatic at night as it is during the day. "We're proud of the walls of Derry, both the ancient ones and the more recent ones, they all have a part in telling the story of the city." But the move, although welcome, is well overdue according to the artists who feel the council's move is "too little, too late". "It is not uncommon to go out and find 20-30 Japanese students standing in front of the murals," says Tom Kelly who feels the civic authorities are playing catch-up to the response the work has generated among visitors. These artists seem genuinely hurt as well as angry that in some quarters their work has been characterised as sectarian. Although the People's Gallery images have toured widely in north America and Europe a planned exhibition in Berlin last year was cancelled at short notice by the Germans. Although they feel they still haven't had a proper explanation about the reason, it is an episode that rankles. Kevin says: "We belong to no political organisations here, we wave flags for no-one. "It's not propaganda, it's genuine art. If we'd been on the propaganda wagon we'd have painted very different art." William Kelly agrees: "How we are and how we are perceived are two different things. "Our work contains no emblems, no Irishness - simply key events that we have captured." Tom adds: "We've been using art as reconciliation. We believe we've pioneered that from the mid-80s doing workshops with Protestant and Catholic kids." The murals have also been studied in modern history classes in secondary schools. With the gallery finished, William says they are still batting around ideas for their next piece of work which, he says, will be a tribute piece to those public figures judged to have made contributions to the city. "We have to do that mural somehow. It's a homage to the people who have stuck their neck out, mainly John Hume - those who championed peace."